The U.S. began releasing coins for general circulation in 1793, but only copper half cents and cents were struck that year. Why were no silver or gold coins issued? The reason is because the law required the Mint Assayer and Chief Coiner to each post a $10,000 bond before handling precious metals. The men in those positions at that time, Albion Cox and Henry Voigt, respectively, were not wealthy men and could not post the bond, creating an impediment to the production of silver and gold coinage. Through the urging of Secretary of State Thomas Jefferson and President George Washington, Congress on March 3, 1794, reduced the bond of the Assayer to $1000 and the Chief Coiner to $5000. Both Cox and Voigt were then able to post the requisite bonds, and soon thereafter, silver coinage started rolling off the presses at the first U.S. Mint. 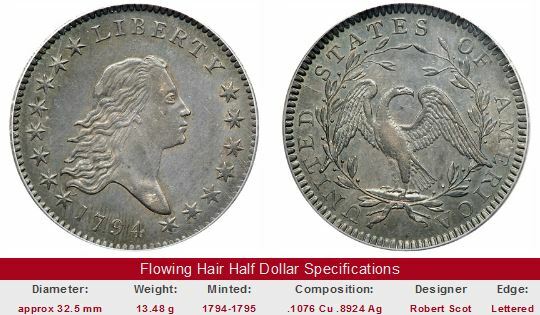 The U.S. half dollars of 1794 carried the Flowing Hair design. The Flowing Hair Half Dollar directly below, graded MS-61, was sold for $391,000 in September, 2007. It is among the finest known examples of this date. This design was used again in 1795, and also appeared on the half dime and silver dollar of those same years. The early Mint was quite concerned about the national image as reflected in its coinage. Responding to criticism of the Flowing Hair design, the Draped Bust type was introduced in 1796 and continued into 1797. The reverse featured a thin eagle perched on a cloud, surrounded by a wreath. No half dollars were coined from 1798-1800. 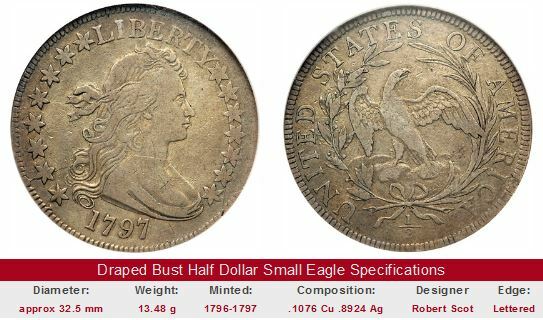 When production resumed in 1801, the Draped Bust obverse was retained, but the reverse depicted a much stronger, "heraldic" eagle. The early decades of the United States saw a rise in patriotism and a uniquely American culture. 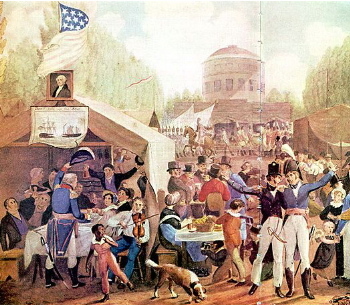 The above is a depiction of the July 4th, 1819 Independence Day celebration in Centre Square, Philadelphia, as painted in 1819 by John Krimmel. The tent at left has a U.S. flag above a portrait of George Washington. Below Washington is a drawing of a naval battle from the War of 1812 (with slogan "Don't give up the Ship"). Benjamin Latrobe's waterworks building is in the background. In 1807, the Capped Bust style was adopted. Liberty wore a "freedman's cap", an ancient Roman symbol signifying new-found emancipation for its owner. Capped Bust Half Dollars continued until 1839, with some modifications along the way. Together, the Flowing Hair, Draped Bust, and Capped Bust Half Dollars comprise what are called the Early Half Dollars. These half dollars were a workhorse during the formative years of the United States. 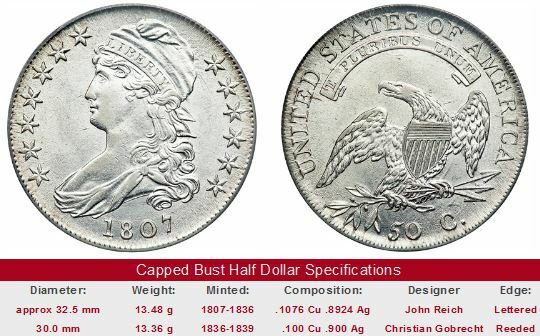 Due to bullion profiteering, silver dollars and gold coins were mostly not available for banking and other large business transactions, leaving the job to the half dollar. What's more, there were no foreign coins circulating of equal face value, thus increasing the half dollar's importance to commerce. Today, the half dollar is nearly invisible, but in its first years, it served as the "coin of the realm". 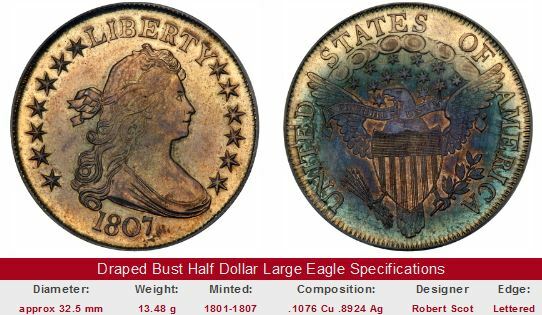 True, eBay auctions has more coins than just about anywhere else, but most of the time, key date Early Half Dollars cannot be found there, yet another indication of their scarcity. Keep checking back, for you never know when one will go up or sale. The coin pictured for sale in the right hand side, if any, is not necessarily the same condition coin or the same date as that represented in the value trend analysis on left hand side.